Most B&M cardrooms reward frequent players, and this is true of Americas Cardroom as well. As you climb through the tiers of this VIP scheme, you’ll unlock rewards that get richer and richer. Keep putting in the volume at the tables to gain the most out of Elite Benefits. Once you reach a given rank, you’ll possess it for the current month as well as the entirety of the next month. Only if you fail to earn enough points by the end of a complete month will you drop back down to a lower rank. Besides the monthly statuses in Elite Benefits, there are two of then that depend on annual RP accumulation. To reach General, you must collect 100,000 points in a year, and to be named a 5-Star General, you need 1,000,000. As you continue to amass Rank Points throughout the year, you’ll get cash payments added directly to your account. The first $10 Medal only requires 750 points, but if you keep grinding hard before Dec. 31, you’ll be able to collect the final $200 Medal if you can get 100,000 Rank Points. Levels of Distinction are kind of super-sized versions of Medals of Achievement: They start out at $2,600 and go as high as $20,000! These outsized bonus payouts are reserved for the top of the echelon, namely Generals and 5-Star Generals. To receive the first one requires enough poker play to gain 200,000 Rank Points in a single year. For each Rank Point that you gather, you’ll also receive Combat Points. The number of CPs you’re credited with per RP is based on a multiplier that gets higher the further you advance up the chain of command. Lieutenants start out with a paltry 1x multiplier, but 5-Star Generals are favored with a 5x multiplier. You can trade your Combat Points in for various items, like straight money put into your account and live tournament packages. In fact, everyone who makes it to 5-Star General gets a complimentary Punta Cana Poker Classic vacation trip without even having to spend any Combat Points at all. Read our breakdown of the Americas Cardroom bonus code so that you can get a first deposit bonus and begin participating in Elite Benefits right away. 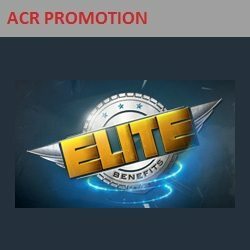 Start collecting benefits at ACR today! For additional information, you can read the review of the Americas Cardroom bonus code here from CasinoSitesUSA.com.